This entry was posted on August 5, 2008 at 6:56 pm and is filed under News, Ravens. You can follow any responses to this entry through the RSS 2.0 feed. You can leave a response, or trackback from your own site. 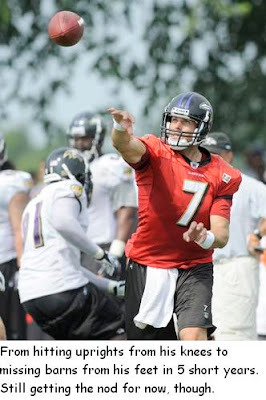 It’ll be interesting to see how this quarterback competition plays out in the pre-season. It’s unfortunate to not feel real confident about any of them.